I didn't realize they were vegan!!!! how fantastic!!!! I was going to try to save them FOREVER!!!!! They are so precious !! The cookies are absolutely delicious! My only complaint really is that there wasn't more. Seriously. I am not usually a fan of hard cookies but these were really good. Nice rich buttery taste. I am neither vegetarian nor vegan and I thought the cookies were delicious. You do get a nice buttery taste and I liked that they were thin and crispy. The sugar you put on to added just the right sweetness. Plus I thought they were real cute. Yes, I liked them. "I tried TTR's ratty sugar cookie and never had any idea it was prepared vegan! If cookies can taste good w/o all the cruelty, that's perfect!" 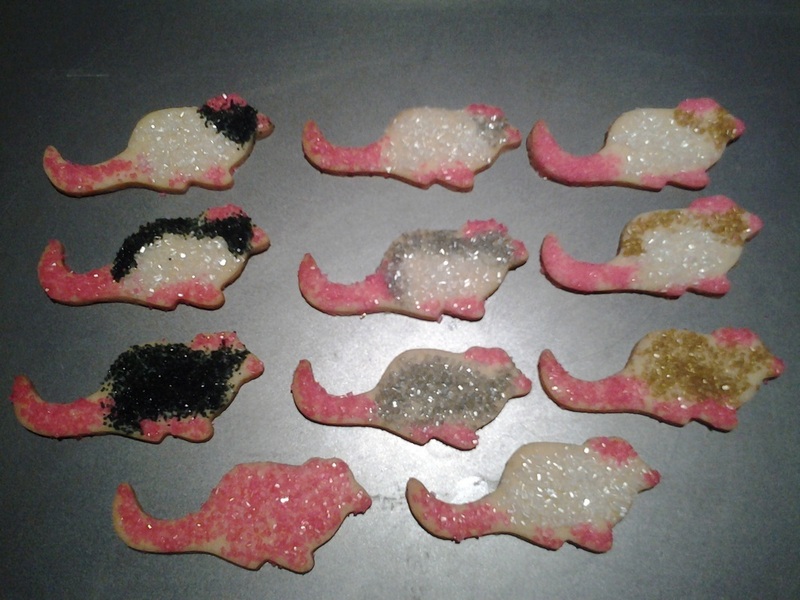 Each package of a dozen cookies will contain an assortment of selfs, hoodies, and capped in black, agouti, and blue, in addition to hairless and PEWs. Each cookie measure approximately 3 1/2" long and 1 1/2" high. These cookies are made with soy-free butter and egg alternatives. *Please note that these are being made by a vegan supporter so that profits can help the rats at Central Texas Rat Rescue.